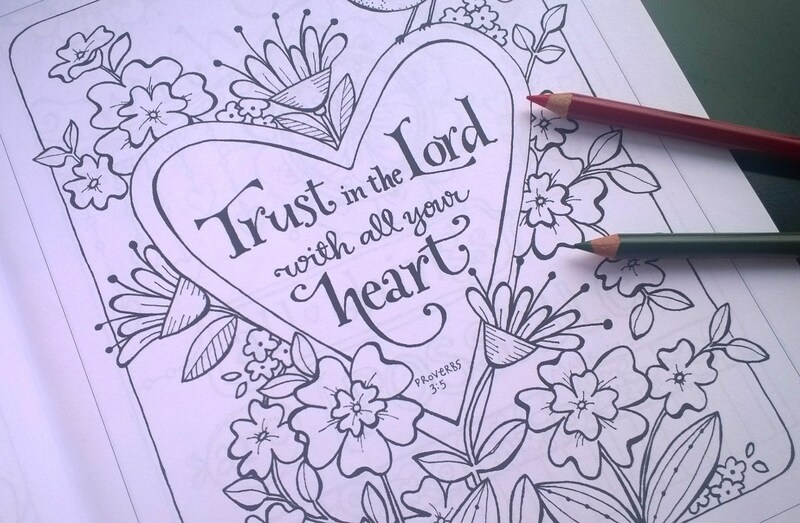 The hot new thing right now seems to be adult coloring books. As an artist I'm all for it. It allows my brain to relax and be creative and restores the frazzled ends of me. Imagine my excitement when one of my favorite artists created her very own coloring books. 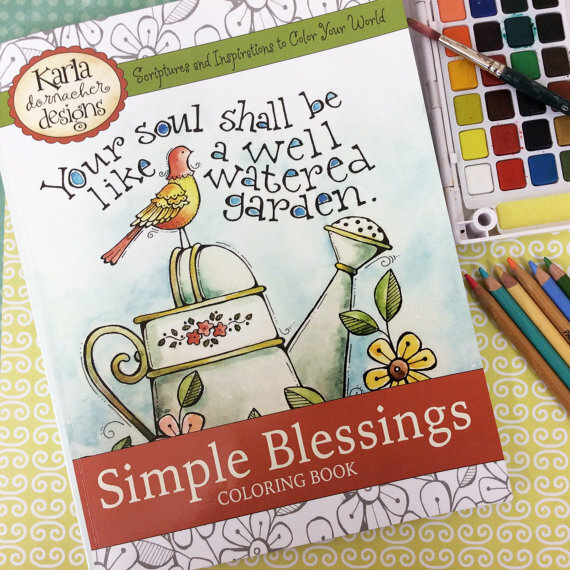 I've enjoyed Karla Dornacher's work for several years now and was overjoyed to get my hands on her lovely coloring books. The tag line on her covers is "Scriptures and Inspirations to Color Your World." Such a wonderful description of what each book contains. As you can see in the above picture the the line work is beautiful and just begs you to fill it in with all sorts of color. Karla has included a very generous copyright that allows you to coy the pictures for your personal use over and over. If you have grandkids, or a Bible study group, or a Sunday School class these books would be perfect. I usually use colored pencils but as a little experiment I ran one of the pictures off on watercolor paper and used my watercolors. I love how it is turning out. If you are a Bible journaler like me you are especially going to like the Bible Journaling Bookmarks that are included in the Garden Blessings Coloring Book. Theses fit perfectly in the Single Column Journaling Bibles that are so popular right now. Even if you are not using a journaling Bible you can still use these as a tip in. In fact I have plans to use several of the pages as tip ins. 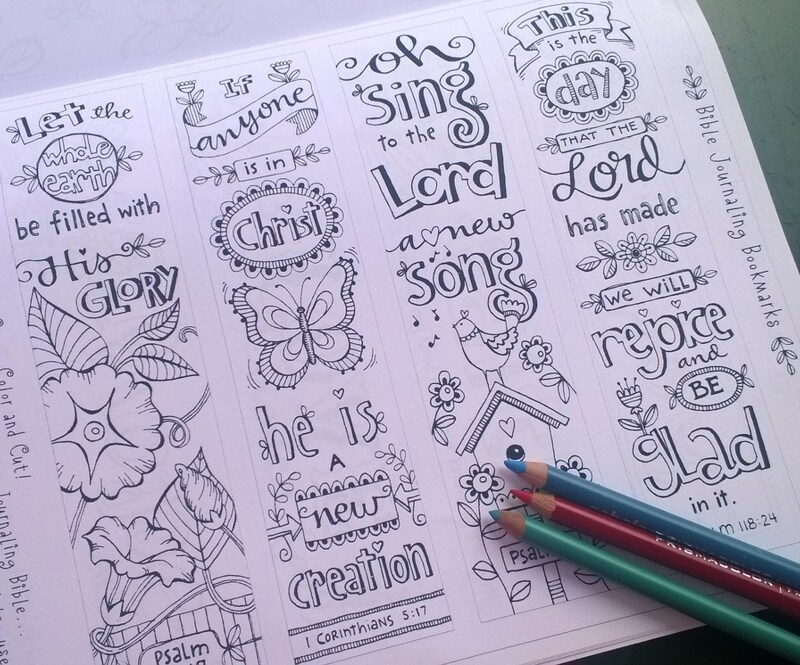 My idea is to reduce them down a bit and run them off on cardstock and then color and insert in my Journaling Bible. So by now you are probably wondering, how can I get a copy for myself? Below are the links to purchase a copy or two of both books. If you want a hard copy of the book you can order it from Karla's Etsy Shop or Amazon. If you would rather have it immediately you can do an instant download at Karla's Etsy Shop. Now . 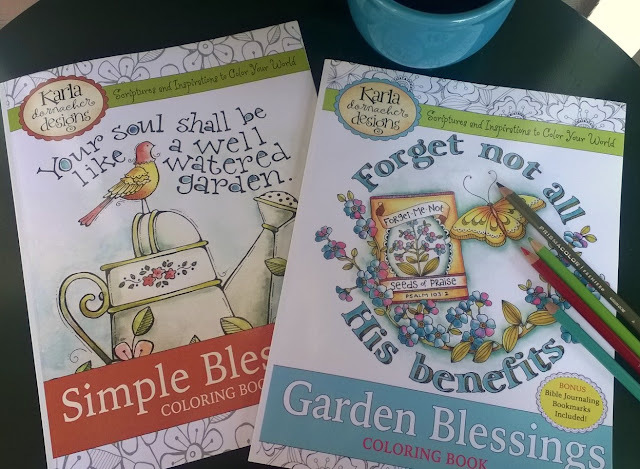 . . how about a GIVEAWAY for a chance to get your hands on these lovely Simple Blessings and Garden Blessings Coloring Books?!! 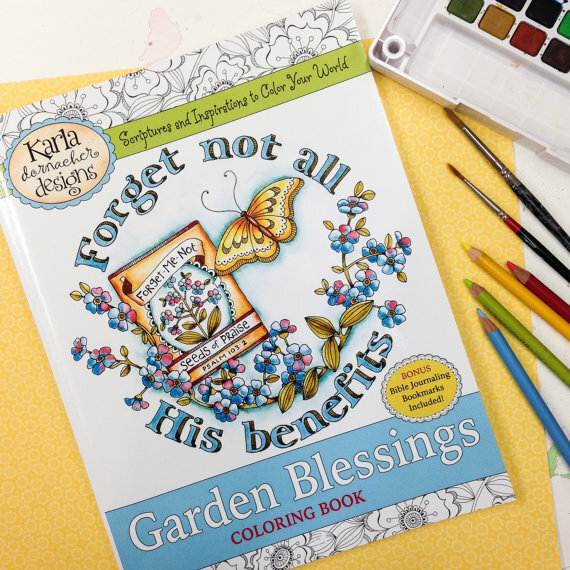 We love these coloring books so much that we wanted to make a way for one of our readers to get their own copies. 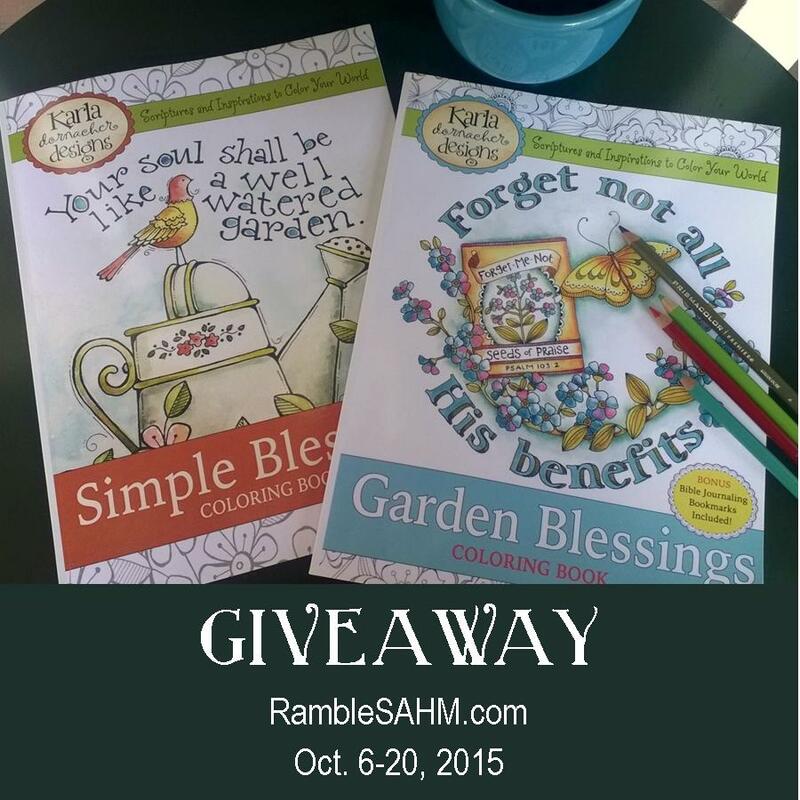 To do that we have partnered with Karla Dornacher to give one of our readers a copy of each coloring book. The giveaway is open to U.S. residents and will run through midnight on Tuesday, October 20, 2015. You must be at least 18 years old to enter. The winner will be contacted by email and will have forty-eight hours to claim the prize. If unclaimed, a new winner will be drawn. The winners’ entries will be verified. Please enter the contest using the Giveaway Tools form below. All entries are optional. These are fabulous! I have been wanting to find some Momma coloring books so I could join in on the fun when the 3 year old pulls his out, but I didn't want something that felt "frivolous." 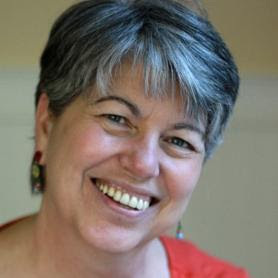 This looks like an excellent way to incorporate God's Word into our everyday "mundane." :) Thanks for hosting this giveaway! Oooh, I love these! My birthday is in 2 weeks, and I've requested an "adult" coloring book and colored pencils. I think the pencils will just have a nice 'feel' and I'm looking forward to some peaceful times coloring. Thanks for a wonderful giveaway :) I love the Christian theme of these. I love coloring with colored pencils. I would love to win this! I have been wanting to try out an adult coloring book! I love coloring with colored pencils and markers the most. Watercolor Pencil! I would love to win. I prefer colored pencils and watercolor pencils! I love colored pencils and watercolor pencils, but really I use anything to apply color! I love the Colored Pencils for Journaling! I love to use colored pencils. I also like water color crayons on occasion. Love Karla....have been following her for quite some time, and I love her work!! Wow, I have to choose just one medium? I don't know if I can...it really depends on the project - I like pastels, crayons, colored pencils, and acrylic paint all! When I'm coloring with my daughter, we use crayons. For bible journaling, I like watercolor pencils. I think I would use colored pencils for these books as well. I am doing my Faith Art in a sketch pad and will be using dry mediums such as colored pencils in it. I like to color with colored pencils. I love to use colored pencils. Thank you for the wonderful giveaway.